extended to the whole Catholic World. seeing it extended to the universal Church, as he had so ardently desired. to the whole Church, he would return to a liberated Rome. The Pope wanted time to reflect a little. advice, but without binding himself with a vow. centenary of the Redemption, raised it to a double of the first class in April of the year 1934.
to the Blood of Christ, already so impassioned by the lively recommendations of Pope John XXIII. precisely this adorable Blood, which is the profound reason of Her royalty. crushed by the Cross brings forth Blood for the spiritual salvation of man. “My enemies have trodden on me all the day long; for they are many that make war against me. Geth? Held in a winepress is His Body, that is, His Church. What is, in a winepress? In pressings. 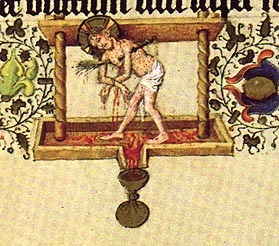 is extending His arms forward so that His Blood will fall from the wounds of His hands into the vat. of believers and is dispensed by the Church through penance and indulgences. which is placed diagonally. Upon the four limbs one reads: Humilitas, Innocentia, Castitas, Caritas. squeezed [in the press] is so abundant that the bride does not have sufficient bottles to store it all…. Virgin is crowning her (see the image). wrenched out in the mystical winepress of the Cross. and wrapped the sweet Saviour in cloth.